[143 Pages Report] The RF test equipment was valued at USD 2.32 Billion in 2016 and is expected to reach USD 3.21 Billion by 2023, at a CAGR of 4.92% during the forecast period. The base year considered for the study is 2016, and the forecast period is between 2017 and 2023. The objective of the report is to provide a detailed analysis of the market based on type, form factor, frequency, application, and geography. The report also provides the information regarding major factors (drivers, restraints, opportunities, and challenges) influencing the growth of the RF test equipment. In addition, the key players in the RF test equipment market are strategically profiled, and their market rank and core competencies are comprehensively analyzed, along with detailing the competitive landscape of market players and describing product launches, product developments, acquisitions, partnerships, expansions, agreements, and collaborations in the market. The RF test equipment comprises business entities such as Anritsu (Japan), Fortive (US), Keysight (US), National Instruments (US), Rohde & Schwarz (Germany), Teradyne (US), Yokogawa (Japan), Teledyne Technologies (US), Cobham (UK), EXFO (US), Giga-tronics (US), Chroma (Taiwan), Good Will Instruments (Taiwan), and B&K Precision (US). 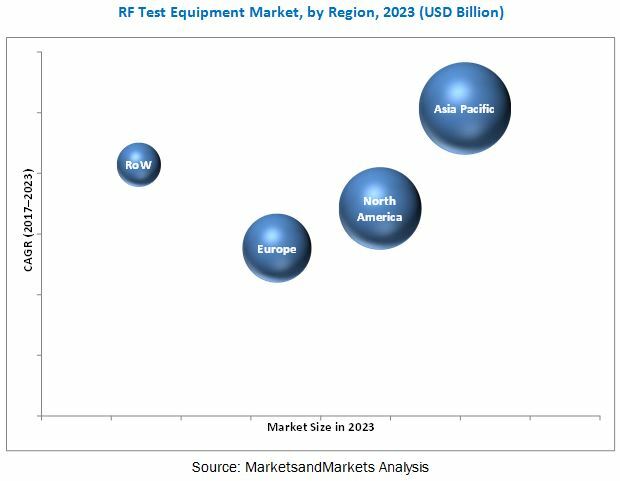 The RF test equipment market is expected to reach USD 3.21 Billion by 2023 from USD 2.32 Billion in 2016, at a CAGR of 4.92% between 2017 and 2023. The major factors driving the growth of the RF test equipment market include the growing adoption of wireless networking in in-building communication systems, rising focus on developing 5G network-based devices, and increasing deployment of IoT technology-based devices for various applications such as telecommunications, automotive, aerospace & defense, and consumer electronics. Oscilloscopes held the largest market share in 2016. For the installation of technologies, robust infrastructure and supporting technologies are required. Parameters such as transmission power and modulating frequency are crucial for error-free working. To ensure the quality of the signal in real-time, an oscilloscope is a key equipment. Moreover, the adoption rate of PXI oscilloscopes is quite high for any test and measurement system due to their ability to acquire and analyze both time- and frequency-domain analog signals and to provide higher accuracy, bandwidth, and signal flexibility compared to traditional benchtop oscilloscopes. The market for RF test equipment having a frequency of more than 6 GHz is expected to grow significantly during the forecast period. With the growing demand for 5G connectivity technology, the demand for RF test equipment with more than 6 GHz frequency is likely to be increased in the coming years. Additionally, various research projects are using potential spectrum above 6 GHz in the telecommunications industry, which boost the growth of this market in the near future. Asia Pacific (APAC) is expected to hold the largest share of the RF test equipment market during the forecast period owing to the growing demand for smartphones is driving the growth of the market in the region. Also, the connectivity solution providers, namely Huawei (China), MediaTek (Taiwan), Renesas (Japan), Sony (Japan), and Samsung (South Korea) are based in this region. R&D teams of top global fabless companies are working in Indian offices. Owing to the presence of manufactures and R&D centers in the region, the demand of RF test equipment in APAC, which is expected to drive the growth of the RF test equipment market in APAC in the near future. However, the longer period of technology shift is expected to be one of the key factors restraining the market growth. Dominant players in the RF test equipment market include Anritsu (Japan), Fortive (US), Keysight (US), National Instruments (US), Rohde & Schwarz (Germany), Teradyne (US), Yokogawa (Japan), Teledyne Technologies (US), Cobham (UK), EXFO (US), Giga-tronics (US), Chroma (Taiwan), Good Will Instruments (Taiwan), and B&K Precision (US). These players adopted various strategies such as product developments, acquisitions, partnerships, collaborations, and agreements to achieve growth in the RF test equipment market.